Early in the morning of D-Day+1 morning the Battalion was called into action to clear the remaining suburbs of Benouville before attacking south, capturing Lebisey Wood and the accompanying village which sat on a hill overlooking the city of Caen. 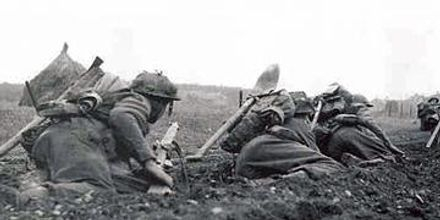 The start line for the main attack on Lebisey (a stream just to the south of Benouville) was in enemy hands and so the plan called for the Battalion to clear the remaining enemy presence in the area around Benouville before launching the attack proper. This was to be with A, B and C company, D company was still entrenched to the north-east at Pegasus Bridge. The Battalions S (Support) company, made up of 6 pounder anti tank guns and 3 inch mortars was held at the already occupied town of Bieville, north on the main road from Lebisey. This was due to the poor, marshy terrain on the slopes leading to Lebisey which the carriers, fully loaded, would not have been able to traverse. It is worth noting that on D-Day itself, elements of the 2nd Battalion, Kings Shropshire Light Infantry (KSLI), supported by a squadron of Sherman tanks from the Staffordshire Yeomanry, were able to push into Lebisey in the late evening against strong enemy resistance. Despite this success, the KSLI and tanks were ordered to withdraw from the area as there was a concern that a strong enemy counter attack could push them from their positions. This proved to be a valid concern, as elements of the 125th Panzer Grenadier Regiment and 22nd Panzer Regiment, part of the 21st Panzer Division, moved in overnight and fortified their positions that the Warwicks were fated to attack the next day. 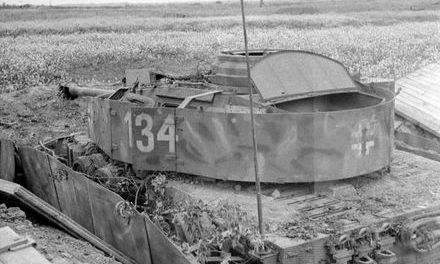 This unit, recreated after its annihilation in North Africa earlier in the war, consisted of fresh troops, led by veteran commanders and boasting large amounts of the feared 88mm anti-tank/air guns and the tactically flexible Panzer IV, many of which had been dug in overnight to make them cornerstones of the Lebisey defences which, if necessary, could be moved for counterattacks. 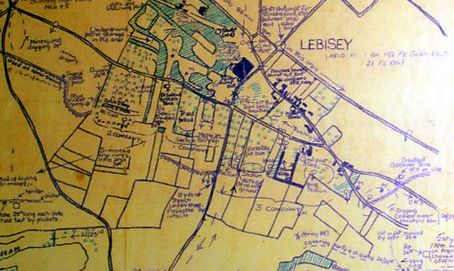 In addition to the defences prepared in and around the wood, the enemy had also constructed a large anti tank ditch on the approach slope to Lebisey which seriously hindered the Staffordshire Yeomanry during its advance with the KSLI. This is noted on the map above which is from Staffordshire Yeomanry records and is drawn from south to north, the area on the bottom left hand corner of the map is the direction the Warwicks would have advanced towards the Wood. On June 7th, the Warwicks initial plan of clearing the suburbs of Benouville were carried out swiftly without serious resistance. The next stage called for the Warwicks three available infantry companies to advance from the river to the wood in an arrow formation, following a barrage from a Royal Navy cruiser and artillery support from 7th Field Field Battery. The option of tank support from the Staffordshire Yeomanry had been ruled out due to the aforementioned anti tank ditch. When the Infantry attacked, they would do so without armour. Elements of the plans however, began to change from the offset. The commander of A company (Capt Illing), whilst conducting some reconnaissance of the immediate area mounted in a Bren Carrier, came under sustained small arms fire. Thankfully no one was injured but this, along with other, similar incidents, showed that the 'start line' for the attack (the area around the stream) was not secure, making a concerted attack very difficult. With this in mind, Captain Illing communicated the situation to Lieutenant- Colonel Herdon who took the decision to delay the main attack on Lebisey by an hour to allow the start line to be secured prior to the advance, with the aim of rescheduling the artillery and naval support to match the attack. Whilst this was able to be communicated across A company, the other commanders and section leaders of B & C companies were not able to be reached on Battalion radios, meaning the delay order was never received. This may well have been due to the nature of the radios in use at the time which could only either send or receive on certain settings, but could not do both at the same time, let alone try to cope any interference picked up from the surrounding area. Due to this, B & C companies started their attack at the pre agreed time, with C company in the middle and B company behind on their left flank, (eastern flank) moving up the hill towards Lebisey wood through waist high corn. Seeing the other companies move off, A company was then forced to commit to the advance despite having called off almost all fire support. The only artillery support available, according to some accounts, was from 'two self propelled guns'. As to what these vehicles were is still being researched, but there are two most likely candidates. One is two self propelled 'Priest' guns (105mm Howitzers, mounted on Sherman tank chassis) from 7th Field Regiment, Royal Artillery. The other is two M-10 Wolverine tank hunters, as part 20th Anti-Tank, Royal Artillery. Whichever this option is proved to be true, these guns were able to provide the Warwicks with at least some fire support, delivering High Explosive and smoke onto, and around, the infantry's target. Committed to the attack, the infantry continued to advance. The morning was bright as roughly 340 men pressed forwards, having yet to be engaged by the enemy. The panzer grenadiers could clearly see the men advancing towards them and held their fire. At roughly 09:00 hours, at a range of 200 yards (the length of 2 football pitches), the entrenched grenadiers opened fire. Small arms, emplaced machine guns, mortars and anti tank guns rained accurate and deadly fire upon the Warwicks who went to ground and returned fire where they could whilst still trying to push forwards. One platoon of B company, led by Lt Dockerty, managed to enter the north easterly corner of the wood but, outnumbered and outgunned by an entrenched opponent, the entire platoon (roughly 37 men) got within 10 yards of the enemy before being killed or wounded, Lt Dockerty was amongst the killed. The bodies of those killed from Dockerty's platoon would ultimately be left where they fell, in front of the German positions, for over a month until the wood was ultimately secured. 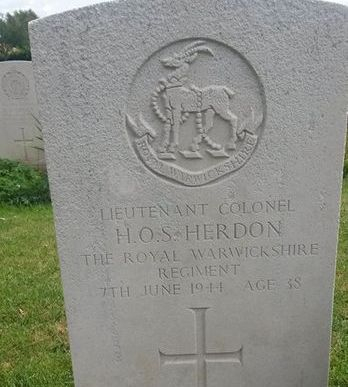 2nd Battalion's ordeal continued for over 5 hours, taking heavy casualties whilst pinned by accurate, rapid fire from the woods, which left many men wounded or dead in the heat of the day, including the Battalions commander Colonel Herdon (who was shot in the head and killed by a burst of machine gun fire as he moved closer to the front line) and a number of other Battalion officers trying to lead their men. Although in a grim situation, Royal Artillery Forward Observers, that had advanced on foot with the Warwick s, were able to successfully contact their batteries and call in increasing amounts of artillery support, targeting the rear of the wood that 2nd Battalion were trying to take. A respite was offered at roughly 15:00 when D company entered the fray, after being released from its position at Pegasus Bridge to the north, it put in an attack on B Company's left flank (eastern flank). This attack was successful in neutralising several enemy positions that had been pinning down men of A company (Sergeant Pittaway is mentioned in Marcus Cunliffe's book, 'History of the Royal Warwickshire Regiment 1919-1955, which records him as having done 'superb work' but elaborates no further). With this threat removed, men of A company finally began to filter into Lebisey Woods most northern side. 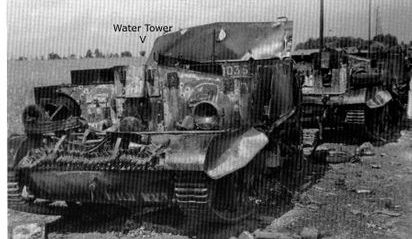 This success was curtailed, however, as 21st Panzer then moved several MkIV Panzer tanks into action and, without long range dedicated anti tank weapons, this then pinned down A company in the woods that they had managed to occupy, being surrounded on 3 sides by the counter attacking German forces. At this stage, the much needed Warwick six 6 pounder anti tank guns were still in Bieville, 2 kilometres to the north, as part of the Battalions Support company, along with the Battalions 3 inch mortar teams. The Company had received no action reports or orders from the embattled infantry to the south (believed to be due to already mentioned problem of the Warwicks radio problems). They had also been warned by infantry of the Kings Shropshire Light Infantry, who were occupying the town, that the enemy was only a few hundred yards 'up the road'. Brigadier K P Smith then approached the senior officer of S company, Captain Bannerman, at what is estimated to have been 4pm. The Brigadier ordered Bannerman's unit south, with the information that Lebisey had been captured and the Warwick infantry companies were consolidating their position. With these orders the Bren Carriers carrying the units 6 pounder anti tank guns, 3 inch mortars and forward Royal Naval artillery observer advanced down the main road to Lebisey at 100 yard intervals with military out riders (motorcyclists) riding alongside. We don't know where this order originated to this day (research is ongoing), but the consequences of it were to be very serious to all the men fighting that day at Lebisey, first and foremost, the men in the carriers themselves. The men of S Company bailed out of their vehicles as the carriers were hit. Many were killed as they bailed out or were caught in their carriers as they exploded. Others were able scramble into the high corn fields on either side of the road where the men hid for the rest of the day as the firefight continued around them. Many were captured whilst other were able to sneak through enemy positions during the coming night and rejoin the Battalion. Likewise few vehicles managed to return to friendly lines but all of 2nd Battalions 6 pounder anti tank guns and 3 inch mortars were lost in the engagement. There is evidence that, at the point of ambush for S Company, that the carrier containing the naval forward observer, Capt J. Lee, (who would be coordinating fire from a Royal Navy cruiser, anchored in the Channel) was hit. 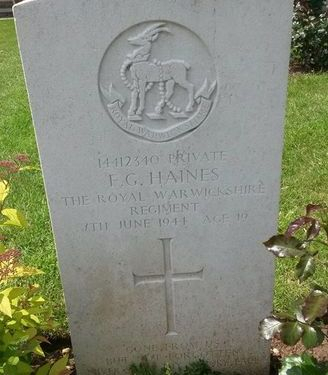 As he bailed out, he received shrapnel through his legs, either from a German mine or from the explosion of his carrier, which resulted in his death. Thus making communication with the heavy guns of Naval support more challenging. By 16:00 the 4 embattled companies of the Warwicks were reported surrounded and, by 17:00, reports came in stating that they were under increasingly powerful attacks from German armour and that ammunition supplies were dwindling. Although surrounded may not have been correct, the urgency and danger of the Battalion's plight was correct. 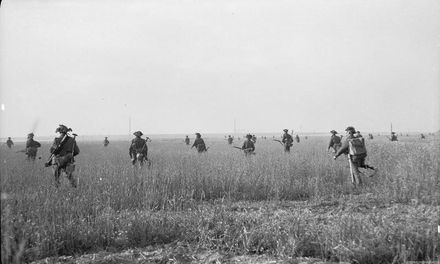 To try and address the situation, the 1st Battalion Royal Norfolks were moved forwards in an attempt to press the attack forward. They advanced, following the eastern most route that the Warwicks D company had followed to Lebisey, receiving small arms fire as they did so. Just like the Warwicks before them, the Norfolks was forced to move forwards with no artillery support, however, at least some elements of the King Shropshire Light Infantry added their small arms fire to support the attack and the Royal Norfolks were able to bring up their S Company, meaning that their 6 pounder anti tank guns were finally able to bring some much needed anti armour support to the embattled infantry. At this point in the fighting the British army had committed roughly 2000 British servicemen in one way or another to the attack on a front less than a mile wide from east to west. After a full day under fire, with many men killed or wounded or missing, the decision was made to withdraw both the Norfolks and the Warwicks from the firefight as dusk began to fall, with the Norfolks at the time believing that the Warwicks were almost wiped out. The decision to withdraw proved to be a fortunate one as, just after the withdrawal had been completed as darkness fell, a very heavy German artillery bombardment hit the area vacated by the infantry. delivered heavy ordnance on the southernmost area of Lebisey, aiming to break up any potential armoured counterattack. 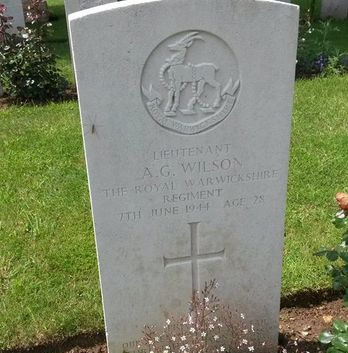 Thus ended June 7th for the men of the Warwicks, and, as individuals and small groups of soldiers returned to the Battalion the roster of dead, wounded and missing was tallied. The Battalion lost 154 fighting men, officers and other ranks, with the Norfolks adding a further 50 to the 'butcher's bill'. The irony here would be to say that the casualty reports, although grim reading, were not as bad as Brigade staff first thought. However, to put it into context, killed, wounded and captured, the British army lost over a companys worth of infantry, for no geographical advance. 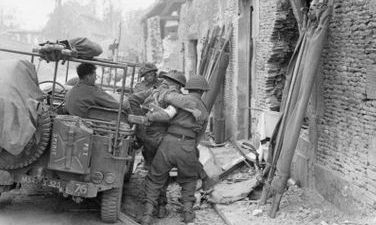 Caen, Monty's D-Day objective, was not to be liberated (and bodies of some of the 2nd Battalion recovered), for another month, on July 8th. For a month 185 Brigade would cycle its three infantry Battalions through front line duties in an almost 1st World War style of warfare, where artillery (and in this case air power) was used to plaster the enemy positions. This stalemate was to continue until the 21st Panzer Division was relieved by the 16 Luftwaffe Feld-Division (moved in from Holland). The 2nd Battalion, after their action on the 7th, would spend the next month re-building and re-organising before being pushed onwards towards Caen. "The lesson of the war is a simple one: forgive yes, forget never." 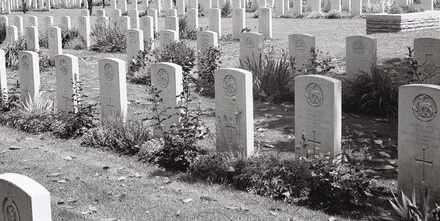 Graves of just some of the Warwicks fallen, laid to rest in a number of cemeteries in Normandy, above, a final line of Warwick men.